What are the updates to TOGAF 9.2? Over the course of more than 25 years, the Open Group has kept the TOGAF enterprise architecture framework current and relevant with frequent updates. TOGAF 9.2, released in 2018, made a number of changes to the framework, tools and methodology. Not only did it introduce new considerations, but it also streamlined a number of key TOGAF practices and even encouraged a more holistic view of enterprise architecture as a whole. 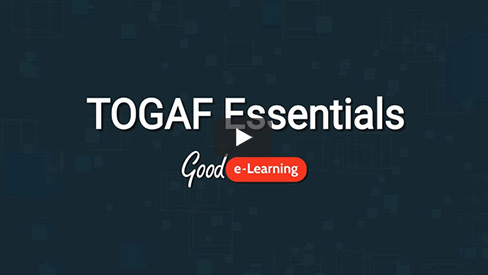 In this video, Mike from Good e-Learning takes a look at what TOGAF students and practitioners can expect from studying version 9.2. The update challenges practitioners with a greater focus on aspects like security considerations, business architecture and digital trends. It also introduced the ‘TOGAF Library’, a streamlined reference architecture that not only consolidates essential TOGAF reference materials, but also did away with a huge number of unnecessary pages. Perhaps most importantly, TOGAF 9.2 also saw the release of the ‘Open Group Credentials’ program. This covers the most important TOGAF essentials, allowing certified practitioners to bring their qualifications up to date with the latest version. Doing so will earn them an ‘Open Badge’, an officially-recognized achievement which will demonstrate their understanding of TOGAF 9.2. Do you have any questions about TOGAF 9.2? Are you interested in becoming TOGAF 9.2 Certified with a portfolio of award-winning online courses? Are you eager to bring your TOGAF certification up-to-date? Browse our full range of accredited, award-winning Enterprise Architecture courses today or visit our FREE downloads area for a wide range of posters, whitepapers, case studies and more from leading industry experts.